September 23, 2015  Volkswagen CEO Martin Winterkorn abruptly resigned Wednesday, a few days after the company admitted it had rigged its diesel engine cars to pass emissions tests. The company faces multiple investigations and possibly billions of dollars in fines. September 15, 2015  This week, the Fed may raise a key interest rate for the first time since 2006. By keeping interest rates near zero for so long, the Fed may have prevented the ultimate financial catastrophe. Will The Fed Raise Rates, Or Keep The (Little) Economic Party Going? September 5, 2015  Friday's decent but unspectacular jobs report didn't answer the question of whether the Fed is about to raise interest rates. But even if the Fed finally takes the plunge, it will do so very gradually. September 4, 2015  The August jobs report boosted uncertainty about the Federal Reserve plan to raise interest rates. Employers added 173,000 jobs — fewer than expected — but the unemployment rate fell to 5.1 percent. August 27, 2015  The aerospace giant is moving to settle a suit accusing it of mishandling its plan. The case is part of a legal assault by an attorney to stop firms from offering workers high-cost retirement plans. August 26, 2015  Panicked selling after stocks have already crashed in value is a lousy investment strategy. But our human brains send us all kinds of bad impulses when it comes to investing. August 24, 2015  With stocks plummeting around the world, the Federal Reserve has a monumental decision to make about interest rates at its September meeting. Some Fed watchers say it won't dare raise rates for fear of adding to jitters about a global slowdown. But others say abandoning plans to raise rates this year would send an even worse signal. 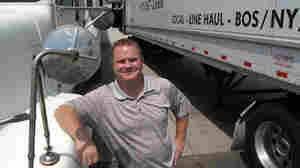 July 31, 2015  Some trucking companies are having trouble finding enough interstate drivers. They say cutting the minimum driving age from 21 to 18 is a fix, but critics worry such a move would be a safety disaster. July 24, 2015  One of the world's oldest and most famous newspapers is changing hands. The Financial Times, based in London, will be sold to Nikkei Inc. of Japan for $1.3 billion dollars. With Greece Facing Economic Abyss, What Will EU Leaders Do? July 7, 2015  The result of Sunday's Greek referendum was a resounding "no" to plans for more austerity as a way out of the country's debt crisis. European leaders meet Tuesday to resume talks on a rescue package. 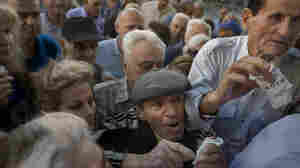 July 6, 2015  Greeks in Athens react to the resounding no vote on a bailout plan. Many are proud to have poked Europe in the eye after years of austerity, but the banks remain closed, hurting many local businesses. July 5, 2015  Greek voters turned down a bailout offer from European leaders on Sunday. Both before and after the votes were counted, Greeks were divided over how the outcome would affect the country's future. July 5, 2015  Greeks voted Sunday in a referendum that could decide whether the country stays in the eurozone. NPR's Chris Arnold talks about the decisive vote against an austerity package from European leaders. July 1, 2015  Greek voters on Sunday face a referendum on further austerity measures in exchange for bailouts. But the unstated question is whether Greece should give up the euro. June 17, 2015  After a two-day meeting with policymakers adjourned Wednesday, Federal Reserve Chair Janet Yellen said the economy is moving in the right direction but continues to recover.